A chestnut is a red(ish) horse with no black pigment. Chestnuts vary greatly, from pale with a light mane and tail (flaxen), to a deep burgundy that can be mistaken for black. Although there is great variation in this color, most chestnut horses will fall into the middle of this color spectrum and are easy to recognize. Mutations in the KIT gene cause white spotting patterns in horses, dogs, cats, mice, rats, cattle, humans, and swine. The frequency of KIT gene mutations vary from species to species but, in horses, it is responsible for more white spotting patterns than any other gene. 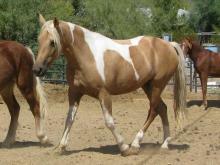 KIT gene mutations are responsible for Sabino 1, Classic Roan, and all the Dominant White patterns (currently at 20). Tobiano can also be added to this group.